In the United States, we’ve witnessed a return of the Roaring Twenties—for the past three and a half decades. 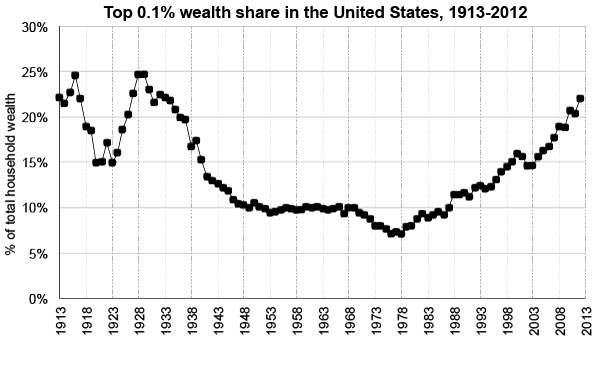 As Emmanuel Saez and Gabriel Zucman show, the share of wealth (defined as total assets, including real estate and funded pension wealth, net of all debts) held by the top 0.1 percent of families is now almost as high as it was in the late 1920s. The opposite side of the wealth coin has been an erosion of wealth, beginning in the mid-1980s, among the middle class and the poor. By 2012, the bottom 90 percent of Americans collectively owned only 23 percent of total U.S. wealth, about as much as they owned in 1940. The growing indebtedness of most Americans is the main reason behind the erosion of the wealth share of the bottom 90% of families. Many middle-class families own homes and have pensions, but too many of these families also have much higher mortgages to repay and much higher consumer credit and student loans to service than before. . .For a time, rising indebtedness was compensated by the increase in the market value of the assets of middle-class families. The average wealth of bottom 90% of families jumped during the stock-market bubble of the late 1990s and the housing bubble of the early 2000s. But it then collapsed during and after the Great Recession of 2007–2009. 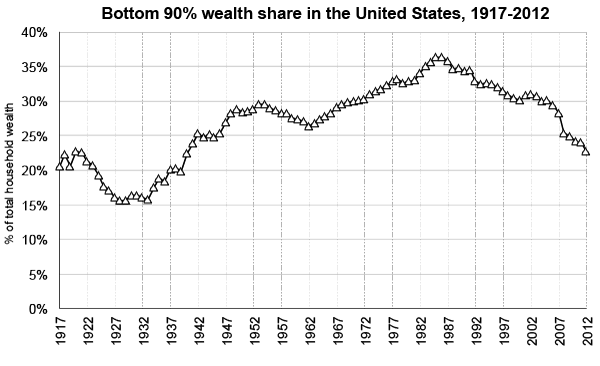 . .
How can we explain the growing disparity in American wealth? The answer is that the combination of higher income inequality alongside a growing disparity in the ability to save for most Americans is fuelling the explosion in wealth inequality. For the bottom 90% of families, real wage gains (after factoring in inflation) were very limited over the past three decades, but for their counterparts in the top 1% real wages grew fast. In addition, the saving rate of middle-class and lower-class families collapsed over the same period while it remained substantial at the top. Today, the top 1% families save about 35% of their income, while the bottom 90% families save about zero. If income inequality stays high and if the saving rate of the bottom 90% of families remains low then wealth disparity will keep increasing. Ten or 20 years from now, all the gains in wealth democratisation achieved during the New Deal and the post-war decades could be lost. While the rich would be extremely rich, ordinary families would own next to nothing, with debts almost as high as their assets. To put it differently—and in honor of the season—what we can expect in the future is a tiny group of extremely wealthy vampires continuing to share in a larger and larger share of the blood of living labor, accumulating more and more wealth, while the vast majority wander the economic and social landscape like zombies, being paid the same amount for the work they do and owning next to nothing. 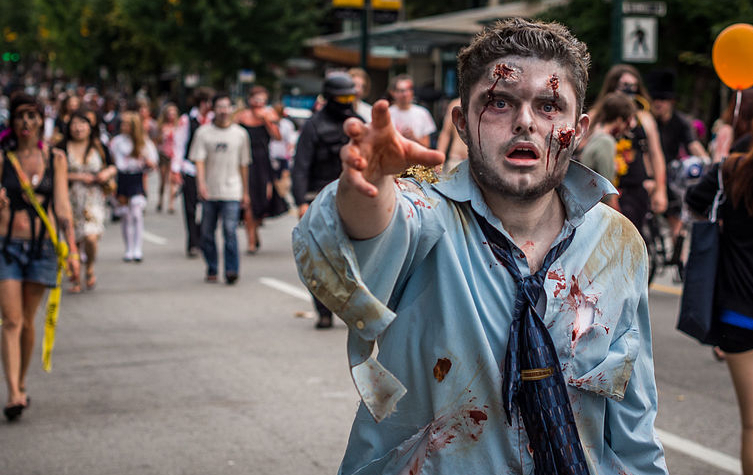 ‘Tis the season, and therefore our thoughts are haunted once again by zombies and vampires. If the modern vampire may have functioned as an apt metaphor for the predatory practices of capital in colonial and post-colonial societies, today’s zombie hordes may best express our anxieties about capitalism’s apparently inevitable byproducts: the legions of mindless, soulless consumers who sustain its endless production, and the masses of “human debris” who are left to survive the ravages of its poisoned waste. But zombies and vampires haunt us in other ways as well. Let’s start with blood-sucking vampires. 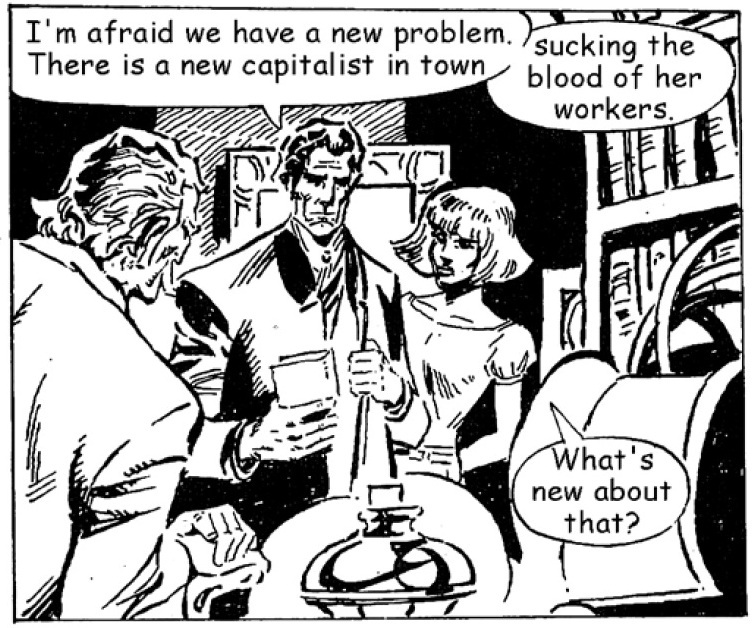 Today, in the United States, as productivity increases but workers’ wages remain stagnant, we continue to be haunted by the image of capital sucking the blood of living labor. What are corporate profits and the incomes of the top 1 percent but the flows of that blood—out of the mass of people who work for a living and into the pockets of those who happen to have sharp teeth and an insatiable appetite for more? We should remember, in Max Brooks’s World War Z novel, when cities were made to be as efficient as possible in order to fight the zombies, the plumber held a higher status than the former CEOs; when the ultra-rich hid in their homes, which had been turned into fortified compounds, they were overwhelmed by others trying to get in, leading to mass slaughter.